In the late 1950’s the hottest programs on TV were quiz shows like “The $64,000 Question,” “Twenty-One,” and “The Big Surprise.” On the “Big Surprise” the contestant chose a subject area and was asked to answer ten Questions ranging in value from $100 to $100,000. 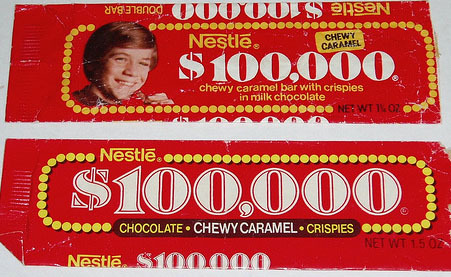 The program sparked the idea for a new Nestle’ product, introduced in 1966, the Nestle’ $100,000 Bar whose name suggests its top-price qualities. 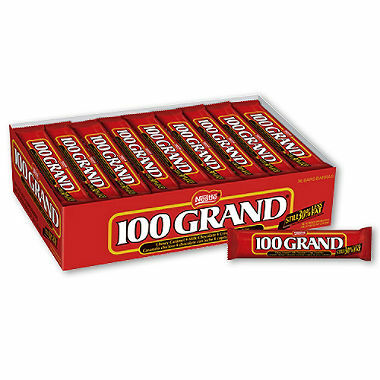 Many of you have asked about the name change from $100,000 Bar to 100 Grand Bar.